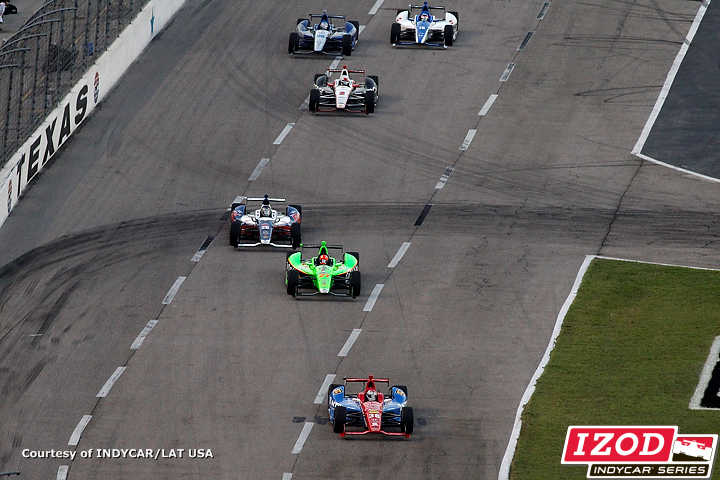 The IZOD INDYCAR Series trip to the Texas Motor Speedway has always been one a fan favourite. 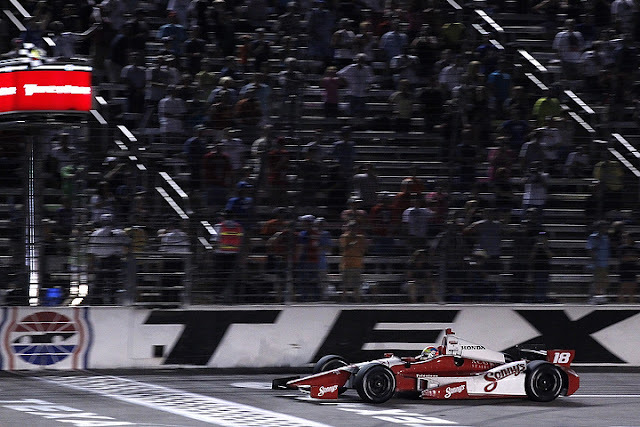 While last year's race featured much of the drama within the twin-race experiment, many believed the reversion back to the single 228-lap formula in addition to the new 2012 race cars would amount to a better quality race at Texas for the Firestone 550. Fortunately, the result for this Saturday night contest among the open wheel racing stars of the 2012 IZOD INDYCAR Series was everything fans wanted. Race-long competition, a few harmless crashes and a late lap fight between two hungry drivers. When the 25-car field took the field at the 1.5-mile Texas Motor Speedway, pole-sitter Alex Tagliani led the Firestone 550 for 20 laps. The #98 Bryan Herta Autosport car's presence at the front was disturbed by the charge of the #9 Target Chip Ganassi Racing piloted with the hands of Belle Isle race winner Scott Dixon. Dixon took the lead from Tagliani through turn 3 coming on the 20th lap. The race's first caution came on lap 31 with Charlie Kimball crashing his #83 car slammed the turn 4 wall. Kimball left out of his vehicle unhurt but expressed displeasure with the driver of the #5 KV Racing Technology driver EJ Viso. "It's disappointing. The car was going to get better and better, especially in clean air. I had really good pace but the No. 5 car of Viso was all over the road in front of me. I had no idea what he was going to do for five laps in a row. I'd go low and then he'd chop me, and I'd take off toward the fence." said Kimball. leaders of the Firestone 550 would pit on lap 36 making use of the caution period ahead of a restart on lap 40 where Scott Dixon continued to lead the early stage of the Texas oval race. Between lap 62 and lap 65, the Firestone 550 saw two potential front-runners fall to the waste side during the Saturday night race. Started with the souring of the Chevrolet engine inside the #28 Andretti Autosport of Ryan Hunter-Reay, Takuma Sato lost control of his #15 car in turn two drawing the race's second yellow flag. During the Firestone 550's first 173 laps, Oriol Servia, Mike Conway and James Hinchcliffe would lead on occasions but the race was dominated by the #9 car of Scott Dixon. The New Zealand driver Dixon was at front for 133 of the laps Saturday night but would not finish the Texas Motor Speedway. After a fantastic performance, the Target Chip Ganassi Racing driver spun out in turn 4 and made slight contact with the wall. "I turned in and the rear just started to slide and I kind of dipped down onto the apron and shut around again." said Dixon who would wind up in 18th place. Following the clean-up of the Dixon caution, the plot thickened to the Firestone 550 as the new leader of the race Will Power made contact with the #11 car of Tony Kanaan during a three-way battle for the lead. Resulting in minor damage to the #11 KV Racing Technology car, the #12 Team Penske car of Power was charged with a violation relating to blocking on lap 194. "I had (Ryan) Briscoe on the outside and Tony (Kanaan) took me by surprise. I feel bad for him. I ruined his day because he had to come in and change the front wing, and we ruined our own day by getting the penalty." said Will Power who ended up 8th in the event. Will Power's teammate Ryan Briscoe inherited the lead of the Firestone 550 on lap 194 but would lose the position 6 laps later to Graham Rahal's #38 Chip Ganassi Racing Dallara-Honda. Through the final 28 laps, the story was about the leading car of Rahal and the charging #18 Dallara-Honda under the Dale Coyne Racing banner. Reeling in the leaders, British driver Justin Wilson in the #18 car focused on providing the first win to his race team since his 2009 victory at the Watkins Glen INDYCAR event. Into the final laps, Wilson caught Rahal and Briscoe for a final two-lap showdown among three cars. Through turn 4, a bobble by Graham Rahal's #38 car opened the door for the #18 of Justin Wilson to pass and win the Firestone 550. Justin Wilson's first oval victory in an Indycar-type machine (counting INDYCAR and Champ car competition for the British driver), this memorable win with Dale Coyne Racing was a significantly treasured triumph against the heavyweight teams in the 2012 IZOD INDYCAR Series that ruled the season. 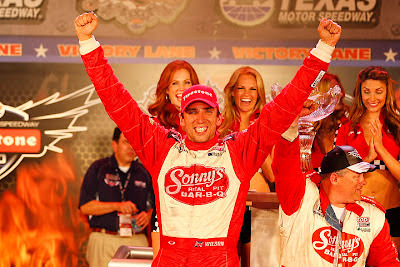 Wilson returned to Dale Coyne Racing in 2012 after two seasons signed with the Dreyer & Reinbold Racing organization. "I just can't believe we managed to pull this off. The car was fantastic. And on the long runs, it just got better and better. I saw people sliding around and knew I just had to hit my marks." said the winning driver of the Firestone 550. 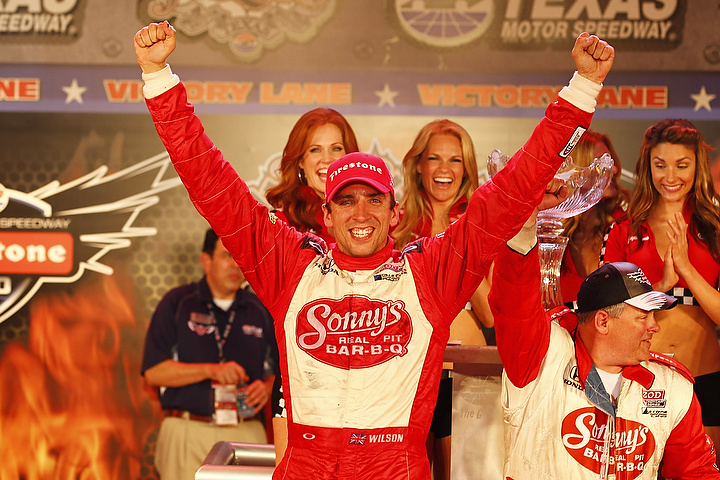 Despite the late-race mistake, Graham Rahal held onto 2nd place ahead of Ryan Briscoe. After being the victim of a degrading Detroit race track on the previous race weekend, the #27 Andretti Autosport driver James Hinchcliffe rebounded to finish 4th. The Canadian driver Hinchcliffe was elevated back to third in the overall driver points standing with Will Power still holding on to the top spot. The euphoria of that win was dampened slightly away from victory lane as the #18 Dale Coyne Racing Dallara-Honda was sent through inspection. An forbidden aerodynamic adjustment on the winning race machine resulted in a fine of $7,500 and the deduction of 5 points earned through the Texas Motor Speedway win.